Teignford, a 3mm Scale Layout. : Buffer stops. 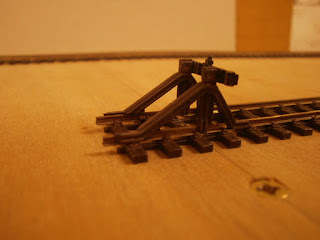 Whilst painting the rail sides, the buffers were affixed with superglue. Given a light wash of track colour, the buffing board is yet to be coloured. Please excuse the yellow colour, this is produced by the camera when set on fluorescent light, shoul have left it on incandescent! However, a good base to start from and tones down the original plastic finish.